Friday's court filing in former Spokane police Chief Frank Straub's $4 million lawsuit against the city is chock-full of fascinating details. Straub's lawsuit accuses the city of recklessly spreading damaging allegations about him without due process. 1. In the documents, Straub says Mayor David Condon and City Administrator Theresa Sanders threatened to ruin his reputation if he didn't go quietly. The Sept. 22 press release in September announcing Straub's ouster said that he had "decided to resign." At the press conference that day, Condon answered a question about whether Straub was forced to resign by saying, "it was mutually agreed this is the best way" to move forward. But Straub says that his decision was between two choices: Jump, or be pushed. Mayor Condon told me that if I resigned instead of him firing me I could "keep my reputation intact" and talk about my accomplishments. Ms. Sanders told me that I had "rebuilt" my reputation "after Indianapolis" and "had accomplished so much" and that I needed to resign in order to "keep my reputation intact." If I didn't "it would be another Indianapolis." I realized I was being terminated, but I was also being threatened with damage to my reputation unless I agreed to go along with a resignation. At another meeting, on the day his ostensible resignation was announced, Straub says Sanders told him "you need to resign — there is no reason to discuss this further." Straub's declaration suggests he fought like hell to try to stop it, contacting an attorney and asking repeatedly for an investigation into the accusations made by police leaders. In fact, Straub didn't actually sign his letter of resignation until Oct. 6, and only then, reluctantly. 2. Straub says he was worried that concerns over his leadership were being discussed at a Sept. 10 meeting with the command staff. But both Sanders and then-Assistant Chief Rick Dobrow told him not to sweat it. Straub says that he asked Sanders about the meeting, and she assured him that there were no issues raised at the meeting he needed to be concerned with. Dobrow, Straub says, told him it was about "the budget." The city's timeline published in December, however, says that Condon met on Sept. 10 with the command staff and the police guild about the concerns over Straub's behavior. 3. Straub says he had requested an investigation into former police spokeswoman Monique Cotton's allegations months before his resignation. It's not completely clear, but this doesn't appear to be a reference to Cotton's sexual-harassment allegations. Rather, it appears to be a reference to his allegedly abusive and profane behavior at a March 31 meeting. Months before, I had been made aware of one complaint arising out a meeting in March 2014 from an employee named Monique Cotton. I had asked at that time that Ms. Cotton's claims be investigated because it is a standard policy for any such claims, and it protects me as well as any claimant. In other words, both Straub and Cotton desired and expected a full-scale investigation into the allegations about Straub's controversial management style. And while Sanders and City Attorney Nancy Isserlis looked into the March 31 meeting, both Straub and Cotton were surprised there wasn't anything more formal or extensive. 4. Straub says he was told the earlier allegations from former police spokeswoman Monique Cotton had nothing to do with his termination. On Sept. 21, I thus asked both Mayor Condon and Ms. Sanders if that older complaint had anything to do with this. They told me it did not, and that there was no complaint from (Cotton) on file. 5. Straub says he fought to keep the reasons for his forced resignation off the press release. The first draft of the press release announcing Straub's resignation was sent by City Spokesman Brian Coddington at 1:32 pm on Sept. 22, only about a half-hour after Coddington denied to the Spokesman-Review that Straub's job was in danger. It included quotes from Mayor Condon and Straub. Members of the police leadership team expressed concerns in recent weeks about Straub's management style. They submitted letters last week summarizing their concerns. "I objected to this language. The entire point of my resignation was to prevent harm to my reputation," Straub said. For two hours, Straub says, he unsuccessfully pleaded with Coddington and Isserlis to remove that language. 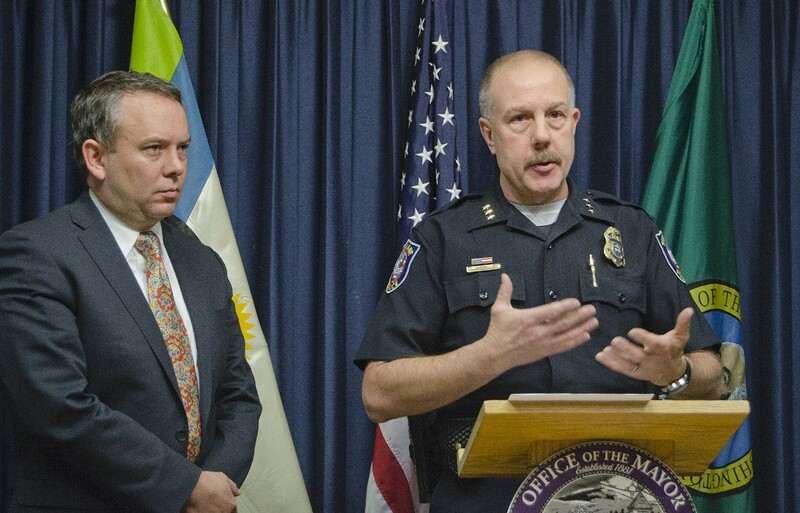 Spokane Mayor David Condon accepted Straub’s resignation today and reassigned him to work on criminal justice initiatives and assistant in the transition to the new chief after some police leadership members submitted letters last week summarizing their concerns about his management style. Further upsetting Straub, the city also distributed two letters from police leaders discussing their concerns. Straub says he had fervently disagreed with those letters, but his requests for an investigation into the matter were rebuffed. 6. Straub was offered a "name-clearing hearing" — but only after he'd been ousted. But Schultz said the offer came too late to matter. "Your offer is in no way meaningful, because the cascade had already been triggered, and the Mayor remained out in public condemning Chief Straub," Schultz wrote in a Dec. 24 letter to the city's outside counsel. She continued to call Condon untruthful. "There is no precedent where a City Mayor apologizes for misrepresenting to the public, while continuing to misrepresent to the public, all at the expense of his police chief," Schultz wrote. 7. While others blame Condon for hiding sexual harassment allegations, Straub blames Condon for telling the media about it. Straub describes the media blitz that occurred immediately after the Sept. 22 press conference where Condon and announced Straub's resignation. Yet Condon wasn't the one who revealed Monique Cotton's sexual harassment allegations. In fact, when the Inlander asked, "were there any sexual harassment complaints lodged against Frank?" on Sept. 22, Condon gave a flat out "no." The information was only revealed by the Spokesman-Review on Nov. 24, thanks to series of records requests made between Aug. 18-21. Initially, in fact, the mayor initially refused to comment on the revelations. Condon's statement wasn't published until Nov. 25, 65 days after Straub had been fired, and it didn't even use the word "sexual harassment." Instead, the statement spoke in vague generalities about how Cotton "raised concerns" that this was "an already difficult situation." He only addressed the issues at length at a press conference a few days later. The lawsuit from former Police Chief Frank Straub? It's still happening.